Seanergy Maritime Holdings Corp., a Capesize dry bulk shipping company, announced its financial results for the fourth quarter and twelve months ended December 31, 2018. For the quarter ended December 31, 2018, the Company generated net revenues of $27 million, an 11% increase compared to the fourth quarter of 2017. Adjusted EBITDA for the quarter was $6.3 million, a 19% decrease compared to EBITDA of $7.8 million in the same period of 2017. Adjusted net loss for the fourth quarter was $2.8 million compared to net loss of $0.1 million in the fourth quarter of 2017. The daily Time Charter Equivalent (TCE)1 of the fleet for the fourth quarter of 2018 was $15,312, compared to $15,378 in the fourth quarter of 2017. The average daily OPEX of the fleet for the quarter was $5,557, up by 2% from $5,468 in the respective quarter of 2017. “During the fourth quarter of 2018, the Company generated net revenues of $27 million, an increase of 11% from the same quarter of 2017 and a marginal sequential improvement from the $26.4 million recorded in third quarter 2018. Our average Capesize TCE for the fourth quarter of 2018 was $17,250 per day exceeding by approximately 9% the respective performance of the Baltic Exchange Capesize Index (“BCI”) which averaged $15,876 in the same period. “During the full year of 2018, the earnings of our fleet benefited from the stronger Capesize market of the second half of the year. Namely, the daily TCE of our fleet increased by 27% compared to the previous year having a significant impact on Adjusted EBITDA which increased by 63% year-over-year. We also entered into innovative commercial agreements for the installation of exhaust gas cleaning systems (“scrubbers”) on five of our Capesizes that are expected to be completed in Q3 and Q4 of this year. Upon completion, the vessels will commence index-linked period employment with three leading dry-bulk charterers ranging in duration between three and five years. The total investment, to be covered by the charterers, is expected to exceed $12.5 million, including equipment and installation costs. We believe that this approach towards the new regulations is the most prudent, since we avoid the installation costs and other uncertainties of the fuel markets. 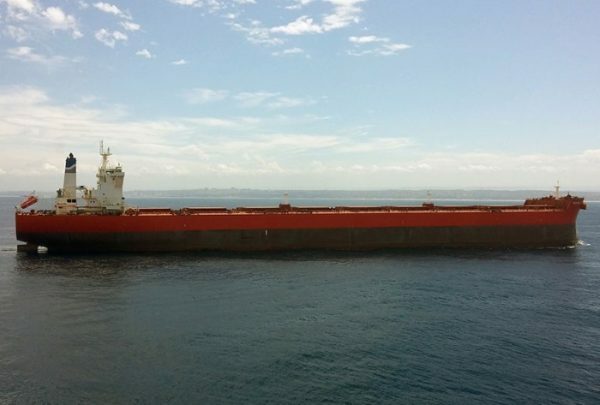 Moreover, we refinanced the M/V Championship through a leasing agreement with Cargill International SA, which released approximately $7.2 million of liquidity for the Company. The vessel was chartered back to us on a bareboat basis and subsequently entered into a five-year time charter with Cargill at a rate which is linked to the average of the 5- T/C routes of the BCI. As part of the transaction, the Company issued 1,800,000 common shares to Cargill. Overall, in 2018 we successfully concluded the debt refinancing of approximately $48 million with new loan facilities or sale and leasebacks exceeding $70 million. As a result, we reduced the average interest cost of the underlying loans by 2.25% and extended the respective maturities by an average of 4.5 years. Moreover, we further expanded our lending relationships with prominent financial institutions in Asia and in the U.S. Finally, consistent with our strategy to focus on the Capesize sector, which we believe to have the most positive fundamentals in dry bulk shipping, we became the only pure-play Capesize company listed in the US capital markets. This is a result of the sale of our two Supramax vessels which was completed in November 2018. The divestment from the Supramax asset class was well-timed considering the subsequent decline in the fair market value of these vessels and the decrease in their earnings. In addition, we expanded our Capesize fleet by acquiring the Korean-built Capesize M/V Fellowship. “In the first quarter of 2019, our main focus has been on preserving liquidity in order to address the temporary market slowdown. In this context, we have concluded a $4.5 million facility with a major European bank, which is an existing lender of the Company. We intend to use the proceeds for general corporate purposes including to partly pre-fund our scrubber capital expenditure program for 2019. The CAPEX related to the scrubbers including equipment acquisition, installation and any off hire, will be reimbursed in full by the respective charterer following the delivery of the vessels to the agreed period charters starting in third quarter 2019. At the same time, we have reached agreements with various lenders of the Company, subject to definite documentation, for the deferral of $3.3 million in principal payments within 2019 to the balloons of the respective facilities. “In the beginning of 2019 we have experienced a sharp drop in the market that was driven primarily by the supply disruption caused by the Brumadinho dam disaster in Brazil. The main drivers of the market in 2019 are expected to be the Chinese government policies and trade relations, the availability of long-haul iron ore cargoes from Brazil, the disruptions caused by the upcoming implementation of IMO 2020 regulations and fleet growth prospects. It appears that the U.S. and China are moving closer to a temporary agreement on trade, and we expect that the situation in Brazil will normalize within the second quarter.